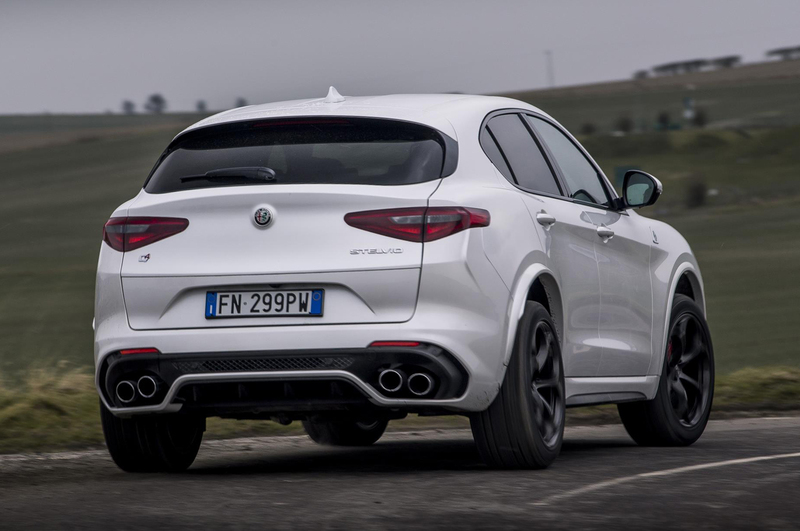 At £69,500, the new Alfa Romeo Stelvio Quadrifoglio comes in at the same price as it's German rival Mercedes-AMG GLC63 (£69,820). Ultimately, you pay the price for a high-performance SUV with a twin-turbo 2.9 litre V6 engine - producing an exhausting 505hp (with the GLC63 behind at 469hp). What else do you get for your money? The Stelvio Quadrifoglio comes in at a hard hitting 62mph from a stanstill in 3.8 seconds, enabling you to reach speeds of 176mph. At the Nuburgring the Alfa reached a rather speedy lap time of 7 minutes and 51.7 seconds. The standard specification of the Alfa Romeo Stelvio Quadrifoglio includes 20-inch alloy wheels, bi-xenon headlights with LED DRLs, leather dashboard and Alcantara seats. Bringing along also a carbon fiber trim, an 8.8-inch infotainment system with Apple Car Play and Android Auto. The range of standard safety systems includes Autonomous Emergency Braking, Lane Departure Warning, Forward Collision Warning and more. Alfa Romeo UK say we should expect to see this cars in the UK this September.